It’s not that you’re unhappy to help – in fact, you could really care about their situation and want to lend a hand. But there’s something about being asked abruptly for a favor – especially after not talking for a long time – that can leave people less excited to take action. It doesn’t communicate any interest or appreciation for them as people. The same idea can applies to your reengagement strategy with your donors. Your donors may not have given for a while, but restarting the conversation with an abrupt ask can communicate a lack of gratitude. Try to ask donors to give again in a more positive way. Remember, donors want effective communication from the organizations they support. With 60-70% of new donors failing to give again the next year, it’s extremely important to take this request seriously; especially because over half of donors who leave an organization do so because of lack of effective communication from the nonprofit. A huge part of communicating effectively is demonstrating you genuinely value whom you’re talking to. So, how should you strike up another conversation with your donors? 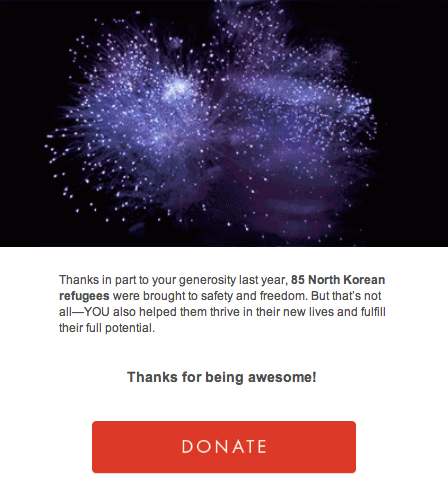 In this post, we’ll look at how one organization, Liberty in North Korea, did an awesome job with their reengagement email. We will break down why this email works, and discuss how you can apply similar tactics to your next email campaign. Perhaps the most striking part about this email is its celebratory tone. The donor hasn’t given in an entire year – why is this suddenly a good thing? Why are we celebrating their lapse in contributions? Shouldn’t we repeat how crucial their gifts are, and ask them to donate again? Rather than just trying to pull another donation, psychology says you will get better results by celebrating your donor’s previous donation instead. In 2012, Liane Young, Alek Chakroff, and Jessica Tom, psychology affiliates of Boston College and Harvard University, conducted a study on the role of self-perception in motivating moral behavior. When participants were asked to recall their past good deeds, and to perceive themselves as moral “do-gooders,” they gave twice as many charitable donations as participants who recalled bad deeds. What does this tell us? By positively reinforcing your donors’ past support, you can make the connection for them between the act of their previous contribution and their deepest perceptions of who they are as individuals. And when making a contribution becomes personally meaningful to them, donors are more likely to give again. LiNK’s email demonstrates this type of positive reinforcement perfectly. Instead of directly asking for another gift, the message just reminds the supporter of their previous donation, celebrates what it accomplished, and validates its importance. It all starts with framing the occasion as an “anniversary.” Let’s compare this approach to a generic ask. 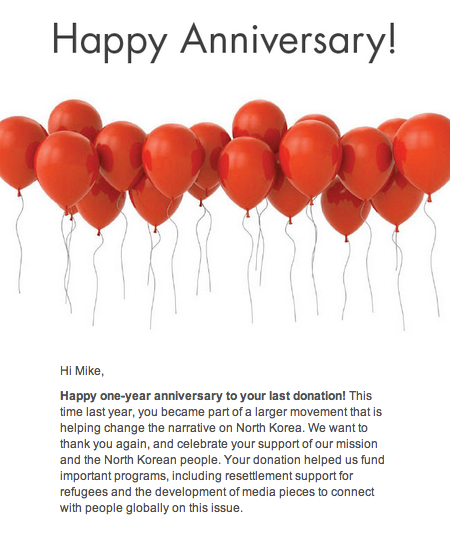 Happy one-year anniversary to your last donation! This gives donors a reason to celebrate! Their last donation was a special occasion, and they can commemorate it by giving again. It’s been a while since your last donation, give again! The main difference between these approaches is the use of positive affirmation. Rather than focusing on what your supporters can do (make another gift), focus on what they have already done. Rekindle their excitement by emphasizing the important role they have already played in your mission. In addition to the supporter’s importance to the organization, the email drives home another point: the direct impact of the supporter’s last donation. The email describes the organization’s programs and communications development it helped to fund. And by giving a tangible number of refugees that were helped last year, the organization translates the gift’s impact into a direct, concrete result. The supporter is shown all the incredible things their one donation produced. By emphasizing “you,” the message makes it clear that the donor is the one driving change. In your own emails, remind your donors that they are the ones making your organization’s impact possible. Let them know that they are ones providing the solution to an urgent need and, most importantly, thank them for helping to make change happen. We’ve talked about what you can say in your reengagement email, but when should you actually send it to your donors? LiNK’s email reinitiated contact with donors who hadn’t given in a year, but this timeline might look different for your organization. Whether you decide to reach out to supporters after a year, six months, or three months, you’ll have to test what timeline best engages your audience. To make a smart, data-driven decision about your timeline, segment your donor lists and tailor your messaging. Using a CRM solution, you can collect and analyze donor data and pull reports based on different criteria. Salesforce, for instance, is a robust backend CRM system that supports many software integrations (including Stayclassy!). By feeding your various applications into Salesforce, you can aggregate all your donor data into one place, streamline your reporting, and analyze donor engagement. By pulling this information, you’ll have the necessary context to personalize your email messages. For one, you can customize the message to reflect the lapsed time since their last donation. You can even set up multiple email campaigns to target donors of different programs or fundraising campaigns; you can then customize each email to speak to how the donor’s gift impacted that specific program. Using an email automation software solution (like Constant Contact, Mailchimp, or HubSpot), set up targeted email campaigns to send personalized messages to these different donor groups. Measure your results, and optimize your timing for the second ask. Put some thought into how you strike up the conversation again with your donors. Don’t just rush into your ask – instead, celebrate their past involvement with your organization. Make them feel good about their support and themselves. Rekindle their passion for your cause, and they will gladly take action once more!